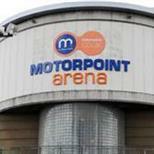 Motorpoint Arena Sheffield (originally Sheffield Arena and formerly Hallam FM Arena) is an arena in Sheffield, England. It is situated near Rotherham, Sheffield City Centre, Attercliffe, Meadowhall and the Centertainment and is the premier concert venue for Yorkshire. The arena opened as Sheffield Arena and was renamed Hallam FM Arena, but returned to its original name as of 1 November 2007. On 9 August 2010, Sheffield Arena was officially renamed Motorpoint Arena Sheffield, after the Derby based car sales company invested 1 million pounds to rename the venue. It is well known for hosting big name concerts and sporting events. East Midland Trains - The Arena has two rail stations within easy reach of the venue: Sheffield's main railway station is situated in the City Centre - Sheaf Street, Sheffield, S1 2BP - and is approximately a 10 minute taxi or Supertram journey to the venue. An alternative station is available at Meadowhall Interchange - which has a Supertram link to the venue - approximately a 5 minute Supertram journey to the venue. From the North: From junction 34 on the M1, take the third exit off the roundabout. Travel along the viaduct to the next roundabout. Take the A6178 towards Sheffield City Centre and Attercliffe. The arena is approximately one mile on the left just past Toys R Us. From the South: From junction 34 on the M1, take the second exit off the roundabout. Travel along the A6178 towards Sheffield City Centre and Attercliffe. The arena is approximately one mile on the left just past Toys R Us. The arena is clearly signposted and is located on the A6178 at the corner of Attercliffe Common and Broughton Lane. Mercury Taxis are Sheffield's Premier taxi company - contact them on 0114 266 2662. Routes 17, 69, 130, 208, 209, 210, 287, 424, X5, X40,X69 and X73 all serve the venue. Nearly 1,000 on-site car parking spaces are available with an additional over-flow facility for 200 cars (please note that the over-flow car park is locked 1 hour after the end of a show - when there is no show at the venue the over-flow car park is locked 24/7). Dependant upon the weather conditions there is a further over-flow car park next to the Arena in the Grass Bowl, thiscan accommodate an additional 500 vehicles. Car parking is payable upon entrance. The Arena has its own supertram stop, with Park & Ride facilities at all main entries to the city. The Arena tram stop is on the Yellow Route which operates from Meadowhall to Middlewood via the City Centre and Hillsborough, with the trams passing the Arena on it's own reserved tracks avoiding the traffic. More information and timetables can be found at Supertram's official web site. The Arena recommends its customers to arrive early and where possible to use public transport - in particular the tram park and ride facilities as the Arena has its own Supertram stop - where possible additional trams will be laid on after the concert to meet demand, Supertram connects the park and ride facilities throughout the City to the Arena. Trams run approximately every 10 minutes from 6.00am until midnight. If you require access to the wheelchair seating location please call the venue and discuss your seating needs. If you should have any queries please contact the venue on 0114 256 5593 or email sheffieldboxoffice@livenation.co.uk. Assistance dogs are permitted into the venue and pass outs will be provided if the customer requires in order for toileting etc. If you should have any queries regarding access please contact the venue on 0114 256 5593 or email sheffieldboxoffice@livenation.co.uk.